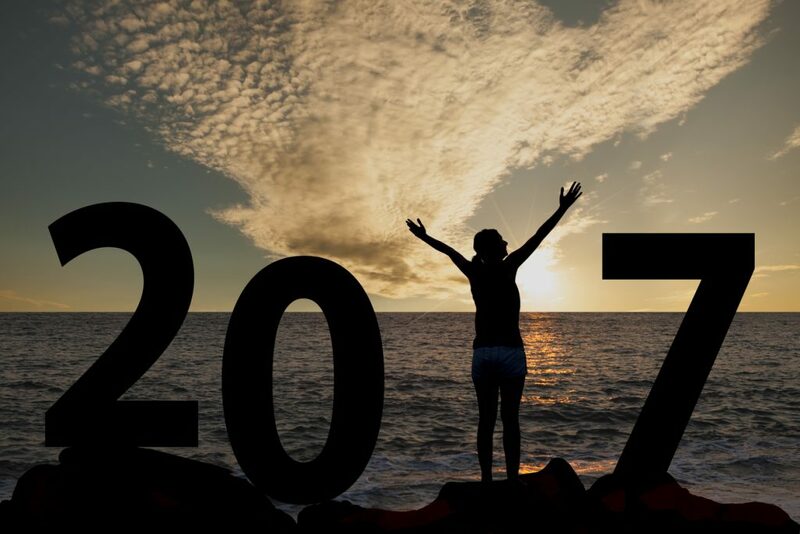 My predictions for 2017 – not what you think. Giving the year is coming to a close, I thought I’d take a quick stock of where I think the property market is heading. My prediction: “steady as she goes”. I know people normally put numbers on their predictions, but what’s the point of making meaningless predictions about things nobody cares about? I mean, I could say that I think the national market will probably grow around 5% in 2017 (which would be my best guess), but who would care? Nobody is investing in the ‘Australian’ market. You don’t buy Australian houses. You buy houses in particular streets in particular suburbs. And the fact is that the Australian market is totally fragmented right now. Even at the almost-macro state level we’ve got totally different things going on. And there’s the over-supplied inner-city apartment market, which is marching to a totally different tune to the detached housing market. There are many trends that the savvy investor needs to be aware of. So rather than get all worked up about this or that number, what I want to look at direction of the broader macro trends. On that measure, I think we’re looking at a year of ‘steady as she goes’. That is, if you invest well in a particular suburb, I think you can expect broad support from the bigger picture. It’s not going to be amazing, but you’re not going to be disappointed either. First up, I’m expecting a resurgent U.S economy. Market sentiment is already high on Trump’s victory, and with a couple of high-profile deals even before he’s taken office, Trump has set the tone for his tenure. The US economy has been in the wilderness since the GFC. It’s due. People think it’s due. Trump will get the credit for a recovery that’s long past due, and to the extent that he’s the lightning rod for a brighter mood, then he might deserve that credit. This is big news for the global picture. The US plays a pivotal role in the global economy, and right now, it only has to do mildly well to be the uncontested world-leader. China, Europe, Russia – they’re all limping from one crisis to the next. A bit of growth leadership from the U.S could totally change the tone of the world economy. For a resource exporter like Australia – who sells the stuff that makes stuff – improving global growth will be great news. And this global dividend will come just in the nick of time, as our economy flirts with stalling speed. The economic numbers for the first half of 2017 aren’t going to be great, but we’ll have already sensed that things have turned. In this scenario, I’d expect rates to remain on hold. If the US Fed continues to normalise rates, the RBA will be happy to let the differential widen and take a bit of pressure out of the Aussie dollar. The RBA won’t raise rates with the Fed, but probably won’t see a need to cut either. For property investors, the action around interest rates will continue to be with what APRA is doing behind the scenes. We have seen sharp falls in higher LVR lending to investors and interest-only mortgages, but that seems to have flattened out in recent months. As the mining states wait for the resource recovery to kick in, I think they’ll keep bleeding population flows back to NSW and Vic. That means the two-speed property market we’ve had through most of this year will continue. 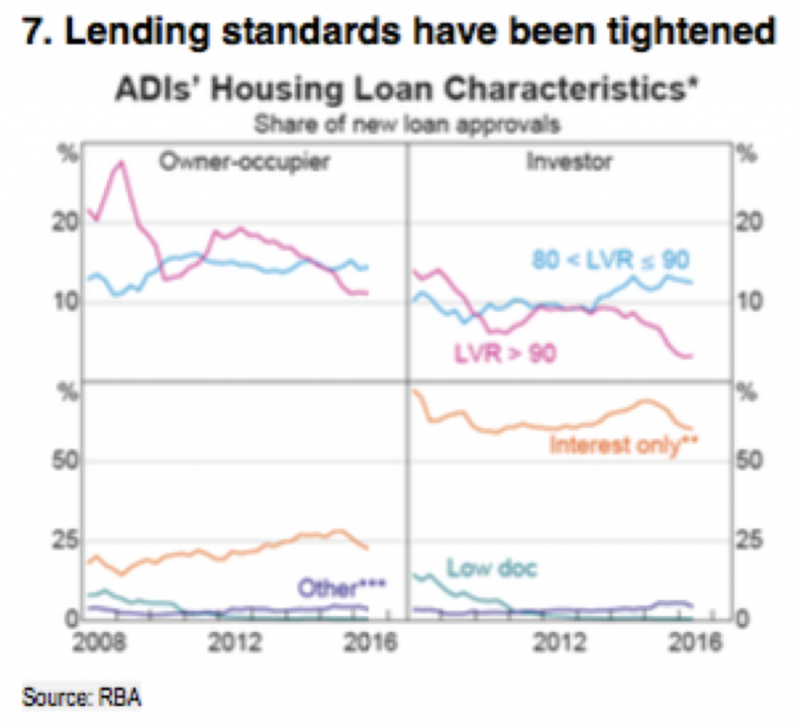 As such, I’d expect APRA will hold off on any nation-wide lending restrictions. If we see any more out of APRA next year, it could be geographically based – e.g restrictions on lending into Sydney. These things are possible. But I’d expect Sydney and Melbourne to be growing around the 8% mark, and I don’t think that’s enough to force APRA’s hand – especially if we start to see signs of trouble in the inner-city apartment market. And for me that’s a question of when, not if. There is a huge amount of apartment supply coming on line. I just can’t see any scenario in which apartment prices don’t start falling. Especially since the key plank of support – Chinese buying – seems to be a bit shaky. China is really clamping down on capital outflows, and that’s going to put a brake on Chinese buyers in the Australian market. 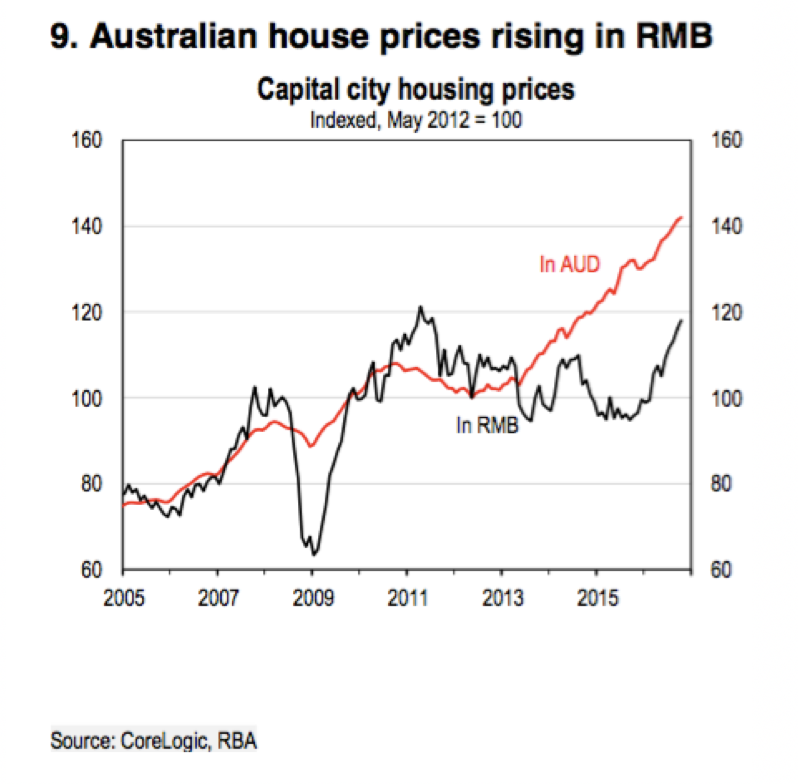 What’s more, a tanking Yuan is making Australian property all the more expensive. In my mind, capital controls, lending restrictions and exchange rate movements all heighten settlement risk in this segment – just as even more supply comes on line. It’s not looking pretty, but my central scenario is that any fallout remains contained to the apartment segment. I don’t see it touching the detached housing market. So that’s how I see it all balancing out. Economic conditions will be supportive, interest rates settings will be neutral, while the waning Chinese buyer will weigh on some segments. All in all, steady as she goes. What do you think 2017 has in store?